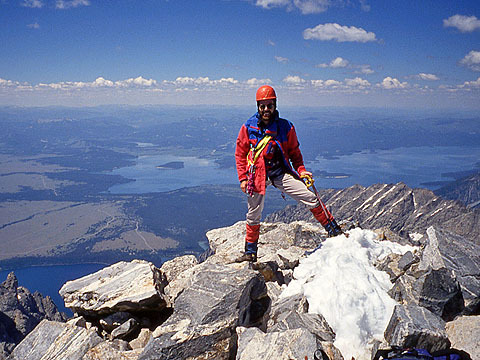 Since it first appeared in 1991, Scrambles in the Canadian Rockies has guided countless scramblers up dozens of peaks. It sold out in its first year and to date, has sold over 40,000 copies. But anyone who has checked off a few “Kane scrambles” has probably wondered about the man behind the popular book. 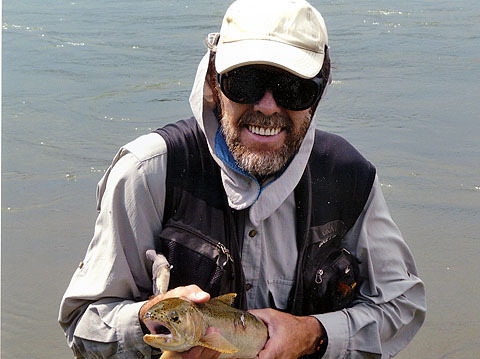 Alan Kane's website suggests he gave up scrambling years ago after a chronic back injury that began with a hang-gliding accident and has since been spending his spare time quietly fishing. That's the impression I had, until I had a chance to talk to him. In January 2013 Alan surprised me with an email. He was updating his book and asked if he could include some of my photos. Naturally I agreed and we began exchanging emails. We discussed photos for his next edition of Scrambles, but we also strayed into other topics which gave me an opportunity to learn more about him. Having done most of his scrambles, I was naturally curious about the venerable climber/author. I met him many years ago and exchanged email with him before, but he was still a mystery to me. Alan declined to meet me (for reasons explained later), so our “conversation” was confined to email. Even so, those emails proved to be more interesting than any conversation we could have had. Unexpected events shaped our discussion so that not only did I learn much about Alan Kane and his current activities, but I also witnessed a story unfolding. After that email in January, Alan continued writing to me, mostly long emails running several paragraphs. He was candid, genial and willing to talk about himself and the work he was doing on his new book. By mid September, after receiving a couple dozen emails from him, I had amassed a lot of material and that gave me an idea. I asked if I could write an article about him. He agreed. This is that article and in it, I'll describe some of our correspondence. You'll have to bear with me if the ride seems bumpy, if I seem to jump from topic to topic. The information that I cobbled together here came from emails spread over many months, emails that contained a hodgepodge of disparate subjects running from back problems to routefinding. If there is a guideline to be found in this article, it's that I tried to keep it chronological, presenting it in the same order that I received Alan's messages. Taking excerpts from his emails (in bold), I linked them together with my own impressions. As I mentioned, our email exchange began with talk of photos. For instance, one of the tasks that Alan faced was redoing some of his route photos, that is, photos of mountains with a red line drawn to indicate the route. In a few cases, the original photos were black and white, and he wanted to replace them with ones in colour; unlike previous editions, his next book will use colour photos. Mount Chephren is one example. 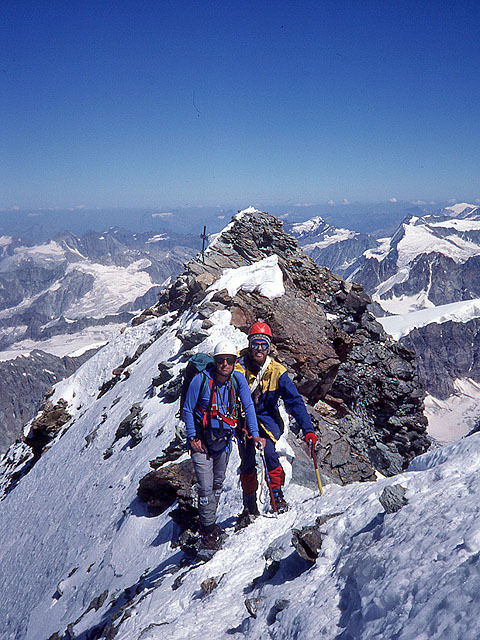 To get a new route photo of Chephren, Alan planned to ascend the “bump” southeast of it. That meant bushwhacking along a lakeshore and then climbing 700 m. I was impressed that he was willing to go to great lengths (and heights!) to get this one shot. But considering his back problem, I wondered if he could even climb the outlier. So I asked him about his back. My back goes through phases where it seems almost back to normal. I had a few good years in the last decade. In the spring of 2011 my climbing/skiing partner Sim and I skied from Bow Lake to TransCanada Highway (the Wapta traverse) in one day, about 12 hours, and my back was fine. I'd done it several times many years ago so I was pleasantly surprised I could still do it. 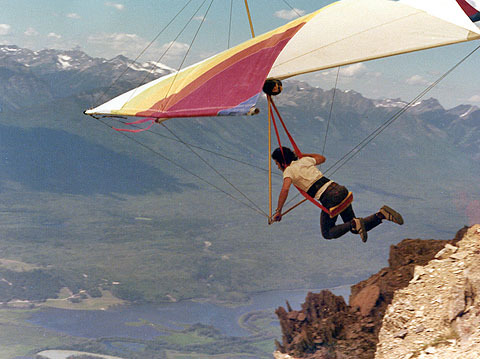 I soloed Chancellor Peak back in 2002 and that was a good year for me. I usually get up a few little peaks each year. Sometimes my back hurts, sometimes not. I go fishing if it bothers me too much. Even with a bad back it isn't hard to outwalk most fishermen and get away from the crowd. With any luck that bump near Chephren wouldn't bother my back too much, but I won't know for sure until afterwards. As for pounding up the peaks, I am spending as much time perusing the web for info and criticism on my scrambles as I am doing peaks. The ones that I do climb, I usually go partway up, to the point where people seem to go wrong. There are only a few peaks that I have gone all the way up again, and that is just for something to do. The more uphill walking I do, the more likely it is to bother my back so I try to be choosey, more so lately. Sometimes being famous is fun, like when my dental hygienist was telling me about her and her husband going out scrambling. I asked how she decided where to go. She said, “Oh we have a scrambles book.” When I said it was probably the one I wrote, she had this look of disbelief and said, "You're THAT Alan Kane?" I laughed. I'd known her for years but it had never clicked with her. I guess I don't mind the fame sometimes on a one-to-one basis like that. People probably expect greater things of me because of that book but I'm mostly a plodder now. Hate to disappoint them, but such is life. I'm not sure it is warranted since it is just an updated book. Nobody else has shown any interest in interviewing me, which is just as well since I am pretty antisocial. One time I joked about starting a climbing club for people like me. It was to be called the "Antisocial Climbing Club" but I could never attract prospective members to a meeting so it never got going. That bit about hiring a guide is a good one. Makes me wonder how that rumour ever got started. I became serious about climbing when I took a waterfall ice-climbing course one cold (-21C!) January weekend. I followed it up in the summer with a weekend rock-climbing course, and a year later, just to round it all out, a five-day mountaineering course. 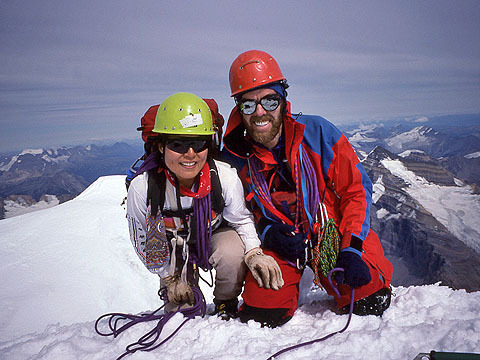 The courses were through a licensed mountain guide, Ottmar Setzer, who was based in Canmore and ran the Canadian School of Mountaineering back in the 1980s. Naturally I put those skills to use as much as I could. I did most trips solo or with one or two others from a small circle of capable friends having similar objectives. Some people even hire guides for fishing and that really surprised me. I just kept going out alone and not catching fish but saving money. The more I fished, the more I saved – I should be rich from it all. That's how it goes when you're too stubborn to give in and too cheap to splurge. It is a challenge writing for the masses. You never know who will have trouble finding or interpreting what is described in words or shown in pictures since abilities and visual recognition skills vary widely. I just try and do the best I can to make it easy to follow. But yes, some people still get lost and then complain. It is inevitable. When Tony Daffern and I were discussing how great a length to go to in a description to make sure nobody hurt themselves when following a route, he said, "You can't compensate for idiots in the mountains." I managed to avoid epics generally, although one time in my beginner days two of us were going to climb Cory Crack on Mount Cory and got stuck behind a slow pair of Americans. We reached the top of the route just about dusk. Since none of us had a headlamp, we descended a short way until dark and then had an unplanned bivy on a ledge way up there. Thankfully it didn't rain but it was darn chilly. Worried my then-girlfriend sick all night. Another time two of us were going to do Mount Stanley from Stanley Glacier and leisurely started from Highway 93 about 8 am in late September. We never made the top, only the west shoulder. Since a Kootenay Park warden told me the backside of Stanley was just a scree pile, I thought we'd get off the backside easily. Not so. We headed down a gully that had runnels of ice in places, steep and loose – slow going. We had no pitons for protection and ended up crawling under a big chockstone for the night, cold and hungry. I was out of water, so I put snow in my water bottle and tucked it into my shirt, which only served to chill me more and created little water to drink. Again, no headlamps. We spent 12 hours huddled under that rock, but I sure learned a lot the hard way that time. 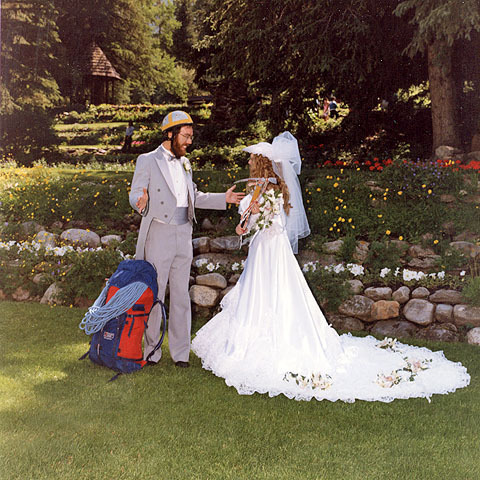 In both cases, I was more knowledgeable than my partner, but each had been to Peru on a Yamnuska course so I assumed they knew more than I did. Neither one believed in early starts and both were pretty slow. For quite some time after those episodes, I scrambled up peaks on my own and had no further epics. Starting early and being able to move quickly makes a huge difference when avoiding epics. Here's an event that scared me. One time several of us went up on Columbia icefield on an Easter weekend to the Twins and Stutfields. In the evening, while skiing back to camp along the track made by about 30 other people that day, we found the tracks were glazed and my wax had no grip. My shoulders ached from pushing so just minutes out of sight of camp, I decided to take off my skis and carry them the last way up a gentle slope. Nobody had been roped at any point that day. I had a ski in each hand, tips pointing forward, and poles dangling from wrist loops. Everyone else was back in camp. I walked a few steps along the ski track when suddenly I found my feet suspended in midair, my body weight supported only by the skis that I was holding in each hand at about waist level. I quickly realized I was hanging above a crevasse of some size, unroped and unseen by my friends. Very, very carefully, with some difficulty, I managed to get my legs out of the hole and kneel very gently on each ski to distribute the weight. Good thing I'd been carrying them pointed forward. I paddled along the snow with my hands for some distance to get away from the crevasse, and then gingerly stood up and clipped into the bindings so I could ski the last way back to camp. I think my first words upon reaching camp were "Jesus, you'll never guess what just happened to me back there!" That was a close one; luck was on my side that day! You can do stupid things and sometimes get away with it in the mountains, but odds are it will catch up to you eventually. Thankfully I learned before the odds caught up to me. I went out and bought myself a new Nikon digital compact with a 25-1000mm lens the other day. Surprisingly lightweight. Now I’m learning to use it, comparing simple auto mode versus aperture priority like I am used to with a 35mm camera. It has more features than I need. Writing a guidebook and having a digital camera would have made life a lot simpler way back when. I am getting tired of sorting slides, cleaning them, scanning, color correcting and removing dust spots. I am debating using a different photo on the book cover but not sure. My wife says the current pic is classic, but I have a couple of others I am toying with. Lately I have been spending a lot of time on the book, making little text changes, rescanning some pics, drawing routes, but I'd say I am 85-90% done. Then I just have to read it all again in case I screwed up somewhere. I don't want to spend any vacation time at the computer if at all possible as I would rather fish, photograph or hike. By this time I was convinced his new book would be, as Alan put it, “just an update, nothing really earth-shattering.” Even with adding “a few new scrambles,” his next edition of Scrambles appeared set to be exactly that. Because of his back injury, I didn't think he would be hitting the mountains much to do his research, little in the way of checking approaches or climbing any peaks. Then all that changed. Alan suddenly dropped his plans for a relaxing summer and became hellbent on overhauling his book. In the months to follow, he began studying the mountains – his scrambles – in earnest. 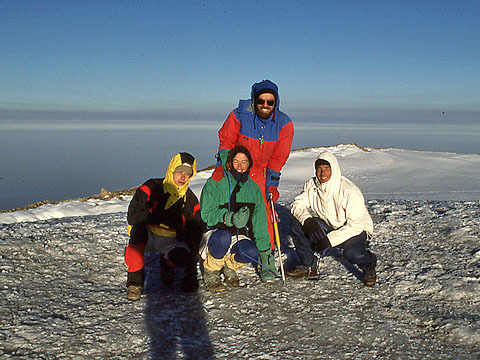 Spending entire weekends and vacation weeks, he explored numerous routes and even scrambled up several peaks. By the end of the summer of 2013 the next edition of Scrambles in the Canadian Rockies was set to become an important update. It all began with a widespread disaster.